I recently found out that there's a book genre called "chick-lit", and it's pretty much rom-com's in book form. And if you weren't aware by now, I love a good rom-com. 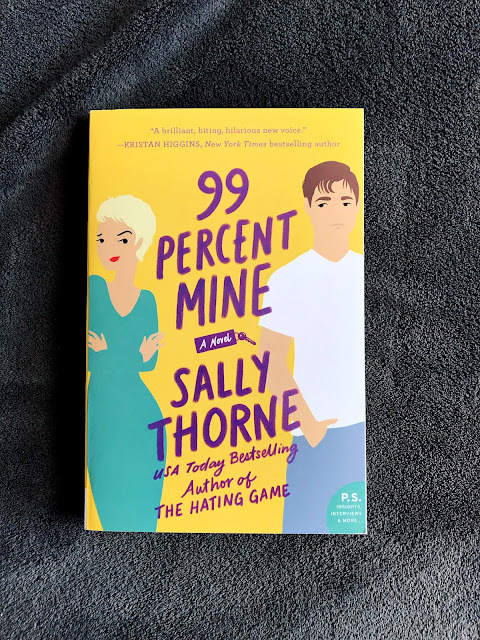 One of my favorite reads last year was The Hating Game by Sally Thorne (which I just found out got a movie deal! ), and when I saw she was coming out with a new novel at the end of January, I rushed to be the first in line at my library. 99 Percent Mine follows Darcy Barrett, who has traveled the world and met a lot of men, but none who compare to her childhood friend (and crush) Tom Valeska. The only mark against perfect Tom is that Darcy's twin brother, Jamie, claimed him as his best friend first. Despite continuous efforts on Darcy's part, Tom has stayed off limits and loyal to Jamie. After finding the man of her dreams when she was 8, and a photography career that peaked when she was 20, Darcy has learned to settle for just good enough. When the twins inherit a ram-shackled cottage from their grandmother, they're tasked with bringing it back to its former glory in order to sell the property. Darcy plans on jumping on a plane as soon as the renovations start, but that all changes once she sees a familiar face on her porch: house-flipper extraordinaire, Tom has come in all his tight t-shirt glory and he's single for the first time in almost ten years. Suddenly, Darcy has a change of heart and decides to stick around and help with the job under the guise of not wanting her brother to ruin the inherit magic the cottage has. Getting close to a sweaty Tom isn't so bad either, or the fact that he's reignited her love of photography. As sparks start to fly, Darcy realizes sharing part of Tom just isn't good enough, she wants all of him. I read this entire book in one day because I just couldn't put it down. Thorne's writing is quick, witty, and adorable. It literally reads like a popular rom-com movie. I could just see it all playing out in my head as I was reading. Her characters are relatable, and actually feel and act like real people. Like most in this genre, it does lean a bit towards the cheesy and slightly predictable side, but I don't really mind much. If you're looking for a fun fast read, I definitely recommend! It's so funny that you just mentioned the "chick-lit" genre, as I have been noticing more talk about this genre on good reads and finding myself drawn to these rom-com type books when I need a good quick read in-between more in-depth novels. I just read The Proposal which falls into this category, and I found it funny that the genre was called 'chick-lit" since I love chick flicks too! Yeah, I've been loving reading one as a little shake up to my usual reads. I'll have to check The Proposal out! I never read chicklit, bit this seems pretty cute.